Let me start by saying that this post will give you different information than you will find in the Gradus catalog. The reason that I’m answering this question is to alleviate the confusion when it comes time to choosing which stair nosingwill work best for your project or installation. As with many factory-made products, there are standard methods recommended for use with Gradus products that are illustrated in the Gradus catalog. We have had so much experience working with Gradus stair nosing and other products, that we have uncovered improved methods of working with the products that are worthy of sharing. If you look at the stair nosing descriptions provided in the Gradus catalog, you will see the illustrations for Traditional stair nosing show the PVC insert being factory installed into the track, or tread portion, of the stair nosing. 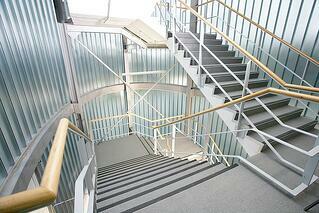 This method requires you to drill through the insert, as well as the stair nosing, in order to install the profile. Additionally, this method requires a plug to be glued into the drill hole in order to cover the exposed screw. Over the years, we have found that a much cleaner and more appealing look can result if you avoid having the inserts factory installed. When you order most of the Traditional stair nosing profiles from Optimum Technologies, Inc., we supply the insert separate from the stair nosing. Instead of having the inserts factory installed, we apply an aggressive double-sided tape in the track of the stair nosing. This double-sided tape holds the insert in place after the stair nosing has been installed on the step. Note that there are a few profiles that require the insert to be factory installed. However, the majority of Traditional stair nosing profiles will be sent with the insert separate and the double-sided tape in the track. The Elite range of stair nosing was developed by Gradus to eliminate the need for drill holes and plugs in the inserts of the stair nosing profiles. 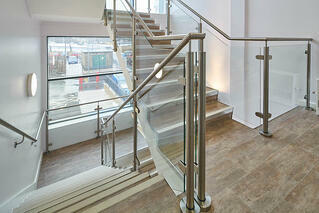 When you purchase one of the Elite stair nosing profiles, you will always receive a separate stair nosing and insert. The stair nosing profiles are pre-drilled, but there is no need for double-sided tape in the track. The special insert for Elite stair nosing already comes with a peel-and-stick double-sided tape on the back of the insert. 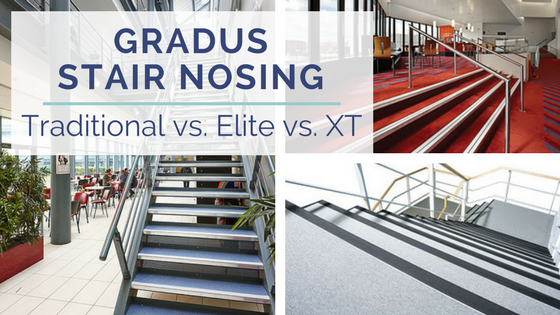 The Gradus XT range is the newest range of stair nosing in the product line. XT stair nosing profiles are available with either aluminum or PVC-u channels and a choice of slip-resistant inserts that extend around the leading edge of the stair nosing to ensure that foot contact is always made with the slip-resistant element of the stair nosing. Since the insert wraps around the edge of the stair nosing and fits into a groove in the profile, these inserts must be factory installed. If you choose one of our Traditional profiles with the Xtra-Grip Plus insert or an Exterior insert, the insert will have to be factory bonded. Since there are no speciality inserts available for the Elite range of stair nosing profiles, this unique requirement does not apply to that product line. 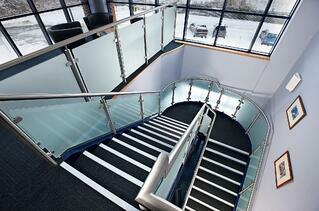 If you have more specific questions about Gradus stair nosing or related products, feel free to let us know. We have also provided a catalog for your reference. If you need samples, let us know and we will send them to you so you can find the right profile for your installation needs.